Welcome to my blog:-) I made this darling card for this weeks Bitten By The Bug 2 challenge. I wasn't so sure I was going to be able to enter this week because I didn't think I had a cartridge with a hot air balloon on it. Thank goodness for My Cut Search because it located one on a cart that I have. I didn't even realize there was a hot air balloon on the Enjoy The Seasons cart. That is such a pretty card! I am always amazed with all the things I can do with my Cricut. Such a sweet card. 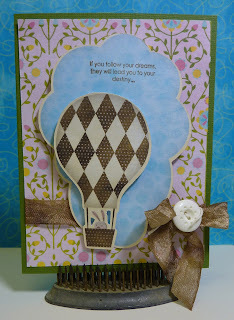 Love the patterned paper on the balloon. Thanks for joining us at BBTB2. Very cute.... love that paper... don't we LOVE My Cut search...I would be lost without it. Thanks for sharing your card with us on our BBTB2 challenge. Great idea to cut your sentiment up to fit on the cart. I love the Enjoy the Seasons hot air balloon and the brown ribbon and button look great with it. Thanks for creating with us at BBTB2. Pretty! Love the balloon and the pretty papers! Thanks for sharing with us at BBTB2! Such a pretty card.Love the balloon.Thanks for joining us at BBTB2. So darling. I love the colors and the cut you used. Thank you for sharing your creativity with us at BBTB2!